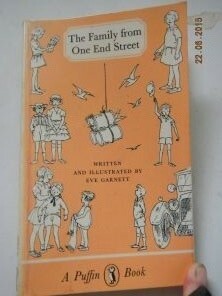 The book 'The Family from One End Street' by Eve Garnett was first published in 1937 by Fredrick Muller. It was published by Puffin Books in 1942 then re-printed in 1945, 1949, 1951, 1954, 1958, 1961, 1963, 1964, 1965, 1966, 1968, 1969, 1971 (twice), 1972, 1974, 1975 (twice), 1976, 1977, 1979, 1980, 1981, (I have been unable to find info on any other reprinting dates for the 22 years until 2004 but as it has been reprinted in the following dates 2003- audio cassette, 2004, 2009, 2010, 2014 I would assume that it was still being reprinted in those 22 years. If you find some dates could you please let me know so I can add them to this blog. I found a website rarestkindofbest.com that mentions that 'this book is perhaps most notable for beating J.R.R. Tolkien’s The Hobbit for the Carnegie Medal of 1937.' Amazing! I have been fortunate to pick up a 1981 edition of this little book from the Life Line Bookfest that was held in Brisbane (2015). I always like to read books at night, it gives my brain something else to think about before I go to sleep. When I picked this book up I didn't really think that I would like it and granted I nearly put it down as the beginning of the book was not something I would normally like but I decided to read more than the first page before I would cancel it out and I am glad I did. I love the down to earthyness of this story. They are poor but do not let that get them down, they just get on with life and not look to what other people have and regret the life they have. Another thing I like about this story is the writing. There is soo much back information. The thoughts and think processes about why something is happening, why it is not wanted to happen, what happens if it does. These days authors are told to delete, delete, delete. Make the story short, compact and in doing so a lot of the back info that has been told to the reader in this story, I think would not be available if it was written today. It makes me wonder when I look at how many times this book has been re-printed since 1935! I am very pleased that I have read this book and would recommend it to anyone. I have found a few remarks other people have written about the story and thought you might be interested. A remarkable series of three books showing the lives and aspirations of an urban working class family, children (Lily Rose, Peg, Jo and Kate) of a refuse collector (Mr Ruddles) and his wife. We are introduced to the Black Hand Gang (innocent by today's standards). The first title was published before WW2. The second, Further Adventures... takes the three youngest children into the country where they experience village life and farming, staying at the Dew Drop Inn. This book was written shortly after the first, but the manuscript was damaged, presumed destroyed, in a Blitz fire but was recovered and reconstructed in 1956. The children return to the Dew Drop on holiday in the third book of the series, Holiday at Dew Drop Inn. These books are not in print, which is a shame, since the writing is of good quality. The most common versions are by Puffin, the second and third made expensive by rarity. The writer (middle class) shows this working class family in a good light, hardworking, anxious to be clean and to better themselves whilst clearly being proud of their roles in life. The story is told with humour, to some extent laughing at most of the characters. The Family from One End Street marked a series of firsts for me. Perhaps most importantly, it was the first book to break the stranglehold of Enid Blyton. Much as I loved the 826 billion volumes of Famous Five et al, the day eventually dawned when I started running a speculative eye over library and shop shelves for stories about something other than the spy-catching quintet. And there, suddenly, were the Ruggles family — two parents, seven children — all rendered equally lively and interesting but all utterly different from each other, and all utterly real. Episodically structured, it became therefore the first book I loved for its characters rather than its plot. And it was the first book not only for me, but for all of its readers when it was first published in 1937, to make urban, working-class children its heroes. Some critics detected a patronising tone towards Garnett's characters, but others praised her for avoiding both sentimentality and condescension and replacing them with what one called "a careful truthfulness" instead. Not that I knew or cared about any of this at the time, of course. I just knew it was a relief to spend time with book-children who, like me, had more experience of a world bounded by building sites, patches of grubby parkland and knackered working parents than they did of one strewn with rolling moors, private islands and spies. It was also the first book I owned that had been written and illustrated by the author. Garnett had been an art student and the book grew out of her walks through the back streets of London as she searched for subjects to sketch. Incidentally, the drawings are lovely — sweet, strong and deceptively simple, like the book itself. But better even than the book was this: it had a sequel. Two, in fact: The Further Adventures of the Family from One End Street, and Holiday at the Dew Drop Inn, which were, if you can believe it, even better. This gave me a wholly misguided sense of life as a process of cumulative improvement, which would take several painful years of experience to dispel, but on the plus side, Holiday at the Dew Drop Inn gave me my first understanding of just how deep the pleasures of reading could run. It was as if, with the story of Kate Ruggles' summer-long stay at the eponymous hostelry and enthusiastic embrace of village life, Eve Garnett had peered into my mind and written down exactly what she knew would delight me most. That seemed to me magic of the highest order and I raced off to other shelves to find it again. The book is a wonderful, crammed-full, meandering affair, exactly like the prose you just read. Each chapter follows the adventure of one of the children (if adventure it can really be called; it’s more like day-in-the-life, but life is very full in a large family at One End Street.) Lily Rose tries to help her mother with the ironing, but the iron is too hot, and the artificial-silk petticoat shrinks to doll’s size. The calamity is enormous: how will they pay to replace it? But in this, as in every other chapter, disaster is averted, and Lily Rose goes home with nothing worse than her mother’s scolding and a slice of cake. And so it goes: Kate takes a scholarship but loses her school hat, and demonstrates intelligence and resourcefulness getting another; the twins James and John have day-long adventures for a secret society; the whole family has a Day Out to London. Every moment is both suspenseful and gloriously ordinary. I have a colleague who is writing an article about the representation of poverty in children’s books. This is a perfect example. This family is living on the very edge of respectability, keeping everyone fed and clothed. Sixpences matter dreadfully. When Kate gets her scholarship, and it pays for tuition but not the uniform, it’s clear she won’t be able to go to school at all, because she’s required to have things like a tennis-racket and shoe bags. But there’s no misery here. Frustration, sometimes; longing for a trip to see family, certainly; sharp reminders of necessity, in almost every chapter. Mr. Ruggles has dreams of finding as much as five pounds in the trash he picks up! But the tone of this book overall is from a child’s point of view: there’s much more interest in adventure and exploration than in the ordinary world of getting enough to eat. Garnett’s skill is that we see a little of both in this book. Several episodes in the life of the Ruggles, a large working class family in a small English town. Mr. Ruggles is a dustman and Mrs. Ruggles takes in washing, and their seven children are well-meaning but occasionally disobedient, resulting in many adventures and mishaps. The Ruggles family is quite poor but morally upstanding, hardworking, loyal and supportive of each other. A little rough around the edges, but fun-loving and lively. 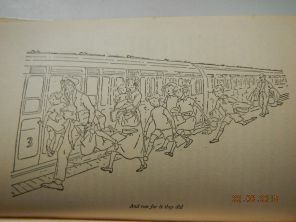 The book is a series of separate episodes loosely strung together: Lily Rose’s desire to do a good deed results in an ironing mishap, Kate wins a coveted scholarship but must scramble to afford the uniform, the twins James and John fall in with a gang of older boys and in an effort to impress them have two wildly different adventures, Jo schemes to sneak into the cinema to see the new colour Mickey Mouse cartoon, and baby William wins first prize at the fair. In the final chapters father Jo finds lost money in a dustbin and the reward for returning it allows him to take the whole family to London for a grand holiday. In the 1930s in Britain it was very unusual for a children’s book to have working class characters. Eve Garnett provided ordinary children from the poorer areas of England stories which reflected their reality. And the Ruggles’ poverty is not underplayed – in every chapter the cost of things is a continual worry, and every penny scraped together is done so with great effort (and sometimes, luck). Today the book is still charming but quite old-fashioned. Children will be amazed by the freedom which the Ruggles children enjoy, as they wander about town and countryside without adult supervision. Nothing terrible transpires, as their fellow villagers and all the strangers they meet are kindly and help them out of difficulties. In particular the rich folk they encounter are without exception generous and giving – a gentler outlook on society than later books about class warfare in Britain. This book was, and still is, a sentimental favourite in the U.K., as it appeared in the top ten favourites of all the Carnegie winners on the 70th anniversary of the awards. Relatively unknown outside of Britain, this book is perhaps most notable for beating J.R.R. Tolkien’s The Hobbit for the Carnegie Medal of 1937.